Hip replacement surgery has a well deserved reputation for making a significant difference to those suffering pain and reduced mobility associated with an arthritic hip. Mr Schouten is an affiliated provider for Southern Cross Health Society. What does a ‘spinal fusion’ involve? Spinal fusion refers to surgery designed to join two or more vertebrae together. This procedure is used to eliminate abnormal or painful movement or can realign a misshaped spine. How can I arrange an appointment? Our preference is for all referrals to be arranged through your family doctor. 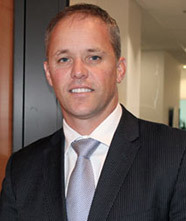 Mr Rowan Schouten is a New Zealand trained orthopaedic surgeon specialising in the management of adult spinal conditions and hip replacement surgery. His private practice focuses on the treatment of pathology affecting all parts of the adult spine (cervical, thoracic and lumbosacral regions) including common conditions such as disc prolapse/‘sciatica’, spinal stenosis (abnormal narrowing of the spinal canal) and spondylolisthesis (where bones of the spine slip out of alignment). When spinal problems produce persistent symptoms an opinion regarding the potential role of surgery and a discussion about the merits of various non-operative treatment options is warranted. Another major part of his practice involves performing joint replacement surgery for the treatment of hip osteoarthritis. He performs surgery at St Georges and Forte hospitals on behalf of many health insurance companies and is an affiliated provider for Southern Cross Health Society. It is recommended that all referrals be arranged via your general practitioner. Urgent appointment times are available for those individuals with conditions that require timely management. Consulting rooms are located on the Ground Floor of the Forte Health building, 132 Peterborough Street, Christchurch.